Invented by Vikan and now an industry standard in most of the world, the hygienic colour coding of cleaning tools reduces the risk of cross-contamination – a major cause of food safety issues – by making sure the tools are only ever used in their intended plant area. The colour-coded Vikan Hygienic range meets all your needs for colour-coded cleaning tool segregation, and ensures compliance with HACCP requirements as well as food safety standards that include FSSC 22000, BRC, IFS and SQF. Award-winning Vikan colour-coded solutions are used throughout the food and beverage value chain. Vikan colour-coded cleaning tools comply with all EU and FDA requirements pertaining to food contact. 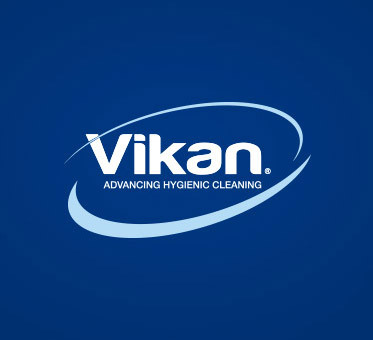 Conducted by an independent accredited laboratory, Vikan migration analysis testing makes sure toxic components aren’t transferred from the cleaning tools to food products. We issue Declarations of Compliance for all food-grade Vikan products, ensuring that you can meet your due diligence requirements. Jette Fruergaard, product manager for our Hygiene range, explains how purpose-innovated Vikan cleaning tools meet very specific needs in cleaning applications. Our Ultra Safe Technology (UST) line represents the pinnacle of hygienic cleaning tools for the food and beverage industry. Click below to find out more. Case story - Masoutis S.A.
Find out why Diamantis Masoutis, a cash-and-carry wholesaler and supermarket owner chose Vikan’s colour-coded brush system and squeegees.